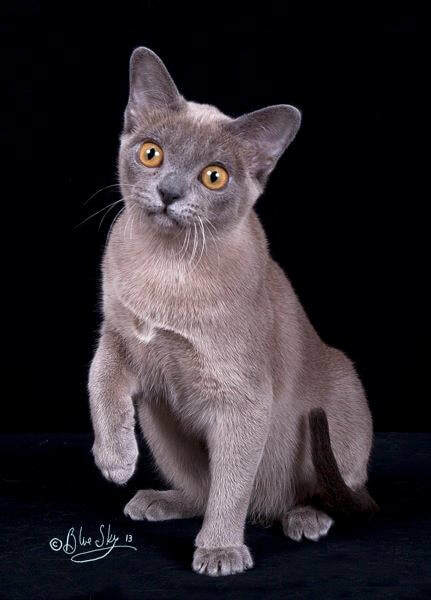 Most modern day Burmese are descendants of one brown female cat that was named Wong Mau, which was brought to San Francisco from Burma (now called Myanmar). 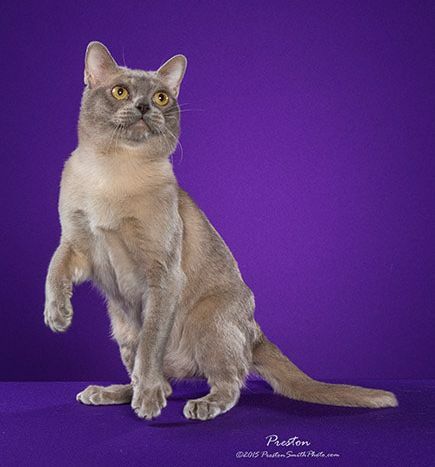 ​Burmese are compact well-rounded cats with surprising weight for their size. They should always show excellent physical condition and never be obese. Some refer to them as bricks wrapped in silk. They have a silky close-lying coat that covers a muscular body. With their big beautiful gold eyes and sweet expression Burmese are comparable to no other cat. There are four colors of the American Burmese. The original, which is a rich brown, is called sable; a warm honey-beige called champagne; a medium grey called blue; and a pale dove-grey called platinum. The Burmese eyes are always gold regardless of the cat's color. In recent years some new colors of Burmese have been introduced. These colors include red, cream, and tortie varieties. In most of the world these are still considered Burmese but in CFA they are grouped under a different breed called European Burmese. These cats have the same wonderful personality of the original four colors. Burmese kittens can be very active and playful and remain playful even into adulthood. 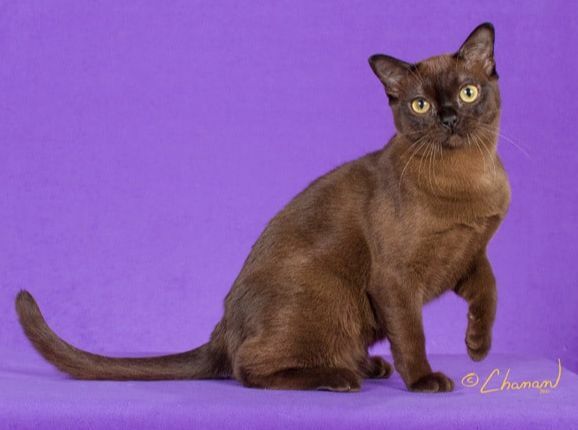 The typical Burmese cat wants to be around people, even over other cats. Burmese females tend to be princesses and the ruler of the house. With their beautiful big eyes and sassy personality, they will have you trained in no time. The males are true lap cats and have that laid-back personality. They both love to greet your guests at the door and follow you around the house to "help" you do your chores. Anything that includes you interacting with them, whether it is watching TV or doing the laundry, your Burmese will be there with you. Most Burmese have been known to learn to fetch small favorite cat toys. Burmese also love other animals, whether it be another Burmese or even a dog. Burmese are great with children as well and most love to travel in the car if introduced to it at a young age. 1. Spend more time with your cat - Just spending some quiet time before work, after work or midday, will make a big difference. Cats love to be talked to and made to feel important. 2. Groom - Most cats like to be groomed or brushed. - This also stimulates the skin and gets rid of dead hair. Regular grooming will also help keep your house cleaner from less shedding hair. Burmese do not shed that much in general, but I like to use a comb called a FURminator which works great to pull out any of the loose hair that they may have. Make sure to follow the recommendations on the package so that you do not damage the hair by over using it. 3. Play - Play is good for both you and your cat! Most Burmese love to fetch and can do it for hours. They also love the laser pointer and catnip stuffed mice or balls. 4. Understand your cat - Know his or her favorite type of play and their favorite time of day to play versus rest. 5. Feed a consistent quality diet - Use a high quality food with AAFCO approval formulation for your cats' life stage. Supplement with healthy treats only in moderation. I recommend feeding a quality brand such as Nutri Source, Blue Buffalo, Royal Canin, or Purina. Try to feed your cat some wet canned food at least once a day. Since cats do not always drink enough water, it is important to make sure they are receiving adequate amounts. The wet food also has more protein than dry food and lower carbs. Adding 1/2 tsp of debittered Brewer's Yeast and 1/4 tsp of Wheat Germ oil is recommended to prevent Vitamin B deficiencies and create a lustrous, healthy coat (or use Missing Link supplement). Treats such as goat’s milk, a cooked egg, raw or lightly braised liver or kidneys, and whatever vegetables your cat will eat can also be useful. 6. Supply plenty of fresh water at all times - Clean the water bowl once daily and make sure it is always full. Avoid plastic bowls if possible, stainless steel and ceramic work the best. The Drinkwell Pet Fountain is a water filter system that works great also. 7. Provide a comfortable place to sleep; your cat should always have a comfortable spot to sleep in. You may want to provide her with a plush cat bed. 8. Carefully choose toys for safety - Not just any toy will do. You really need to consider safety issues when choosing toys for your cat. For example, are there any parts that can be torn off and swallowed? Is it something he or she might "eat" thus causing a possible intestinal foreign body that could require surgery? Will it please your cat? Choose toys that cannot be chewed or swallowed. Small fur mice, round balls, or feather teasers are great interactive toys. Also, a laser pointer can be fun for both you and your cat! 9. Supervise - Always keep a watchful eye on your cat for dangerous or destructive behaviors. Never let your cat play near or in the clothes dryer or washing machine. I can tell you horror stories from adoptive parents. 10. Exercise - Daily exercise will keep your cat fit. Additional exercise can help with some behavior problems as well. 11. Don't let your cat get fat - Adjust food intake for body type, provide healthy treats, and exercise regularly to avoid extra weight gain. Halo makes a great low fat treat that cats love called Liv-a-littles. 12. Be observant - Monitor absolutely everything your cat does. For example, did she eat all her food today? Has she been drinking? Was her urine and bowel movement normal? Is her activity level the same? How does she look? Is her hair coat okay? If you pet her, do you feel any abnormal lumps? Have you seen any coughing or vomiting? Early recognition of symptoms can save your cats life. 13. Visit your veterinarian regularly - Be sure to maintain an appropriate schedule of wellness and recheck appointments. Your cat's needs may continue to change depending on their life stage or health conditions. 14. Friends - Your cat appreciates friendship from his species as much as a person appreciates friendship from his. The best way to accomplish this is to have at least two cats. Keep in mind that they don't have to both be Burmese. 15. Litterbox - An outdoor cat rarely uses the same location twice to urinate or defecate; therefore, an indoor cat requires your assistance in this area. The litterbox should be cleaned twice daily. The box should be emptied and scrubbed once a week. Scooping the feces daily is a good idea. SEXUAL MATURITY: Male and female cats should be neutered and spayed, respectively, between 5-8 months of age. Males will not spray once they are neutered. TRAINING: Cats are trainable, but it requires patience. The basic principle is reward (tasty snacks, catnip, strokes and praise) for laudable behavior like using the scratching post; and negative enforcement such as a raised voice or a spray bottle spritz for kneading the couch. Corporal punishment is counterproductive in cats. Greta, Fox, Matilda, and Lizzie. © 2010-19 Evita Burmese. All rights reserved.